Support your favorite sports team during the playoffs and all year long with Team Name and color dogtags! Customize to Buy your Sports Fan Dog Tags now! 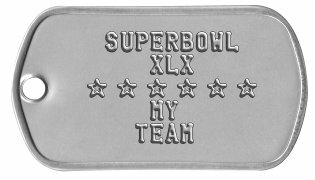 Get ready for the playoffs and build your team spirit with customized dogtags for all your players with their name, number and team colors! They make great keepsakes for year end wind-ups and tournament celebrations. Dogtags also make great low-cost customized award medals for competition winners: Gold, Silver, and Bronze! Your contest participants, winners, and MVP's will love wearing these award dogtags. Ideal for sports leagues, birthday party events, and company picnics. We also offer bulk discounts when you need tags for lots of people! All orders are shipped within 1 business day and are usually delivered within 1 week (in North America). 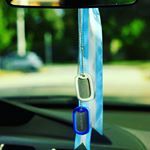 If you need any assistance creating or ordering your Sports Fan Dog Tags please contact us directly, we are here to help!